On the 19th of April 2016 my favorite festival drink Desperados will launch the new House Party Plugged campaign, a campaign inspired to a unique experience: pioneers in music, combined with every day content. 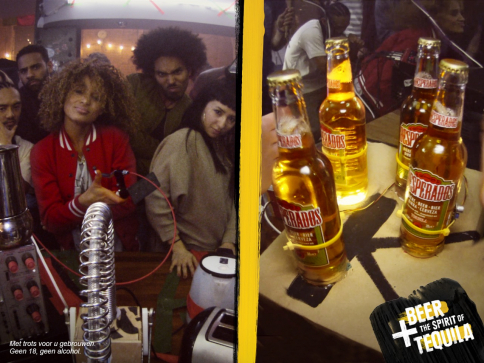 Desperados – the fresh beer known from the combination beer + tequila – has a collaboration, especially for The House Party Plugged project, with the iconic music pioneers, the in the UK based DJ and producer Riton, known for his innovative Electro music, and the Rome-based techno-street drummer Dario Rossi. In the House Party Plugged video can be seen how the English DJ/producer Riton – well known from the probably biggest 2016-summerhit ‘Rinse and Repeat- and techno-street drummer Dario Rosse create the ultimate house party together with Desperados: one house, many party people, unseen daily items turning into electronic music instruments and becoming Riton’s number ‘Rinse and Repeat’ in the remix.